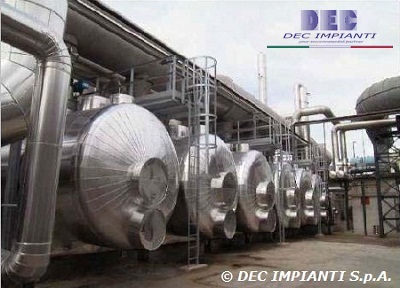 DEC IMPIANTI is offering several decades of experience in design and installation of the most technically advanced and efficient activated carbon vapor phase filters (ACF). Whenever our customers are requiring a backup system to the main VOC bataement plant (typically an oxidizer), the solution to install an Activated Carbon Filter may be the winning selection. The system is optionally equipped with its suction blower, interception valves, automation and, depending on the solvents to be treated, a fire detection system (DEC.FPDS™). The DEC.ACF™ unit may also be coupled with the cryogenic solvent recovery systems (DEC.CRY™) for further reduction of VOC emissions at the stack of the plant. Once the activated carbon filter has to be replaced, the carbon, has to go through the reactivation phase, a high-temperature process which destroys trapped organic pollutants and frees up the pores of the adsorbent. All activated carbon in the form of pellets (granule or extrudate) which are hard enough can be reactivated and thereby have most of their initial capacity restored. If the quantity of the carbon is very low, the adsorbent may be disposed-off.